The world runs, day in and day out, because of unsung heroes. Families, organizations, and businesses all stay afloat because of men and women who shoulder the necessary tasks, day after day, often without fanfare, thanks or even acknowledgment. Pat Scott was one such person. He gave the recent years of his life to two things: presenting live music, and making the world a better place. And he did both with quiet dedication, without thought of reward or credit. I first met Pat a few years ago. 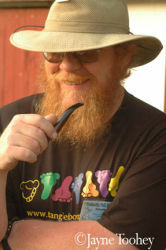 He cut a distinctive figure: Big red beard, tinted glasses, hat, pipe, usually wearing a t-shirt from a music festival or conference. He wasn't real talkative, but you could tell by his sidewise grin, he didn't miss a thing. I began running into him everywhere, often with his sweetheart, Ginger: at the Northeast Folk Alliance, Philly Folk Festival, the Susquehanna Music and Arts Festival, the Falcon Ridge Folk Festival, and lots of venues near Philadelphia. Pat volunteered everywhere, handling merchandise sales, stage managing, directing traffic, and doing everything else that was needed. He simply showed up, said, "What do you need me to do?" and went about doing it well. Pat was also active in community organizations and progressive causes. He was especially involved with Women In Transition (WIT), which provides support to women in Philadelphia who are endangered by domestic violence and/ or substance abuse. Through his kindness, care, and can-do spirit, Pat became a trusted part of WIT's community. Pat passed suddenly last November, and there was a beautiful memorial service in December, bringing together Pat's family and his friends in the music community. After the service, I called up Cheryl Prashker, LisaBeth Weber, and Maggie Marshall, and we all recorded two songs under the band name "Philly Friends," releasing them as a two-song EP. Photographer Jayne Toohey, the fifth "Philly Friend," collected some beautiful photos of Pat, and did lovely graphics for the CD. Members of the Philadelphia folk community generously donated to help finance the project. Ginger Osborne provided invaluable guidance, support, and blessing. And, ALL the proceeds of the CD are going to benefit Women In Transition. So, I don't normally use this newsletter to trumpet my own projects, but I'm happy to do it this time because it's a community effort, it can do some good in the world, and it's a way to tell folks about our friend Pat Scott. 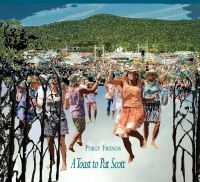 Come get the "Philly Friends" CD at my (or Cheryl's, or LisaBeth's) shows, or purchase it (in CD or download form) on my website. I feel lucky to have known Pat--he's a reminder of all the unsung heroes in our lives. Who are some of the ones in your life? Let them know!